Sally Hansen Turquoise Opal. What can I even say about it? It is the crown jewel of the Nail Prisms collection. We all know it, we all love it... It's undeniably one of the prettiest nail polishes ever created. 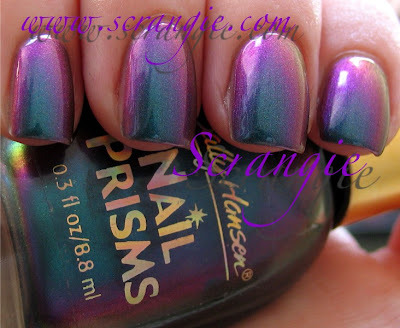 Sally Hansen Nail Prisms #16 Turquoise Opal. This is four coats. It is sheer, but if you have the patience to wait a few minutes between coats, it will be well worth your time. It starts out turquoise and blue and shifts to every color of the rainbow. Purple, gold, red, pink, green... It's all there. A masterpiece of polish. 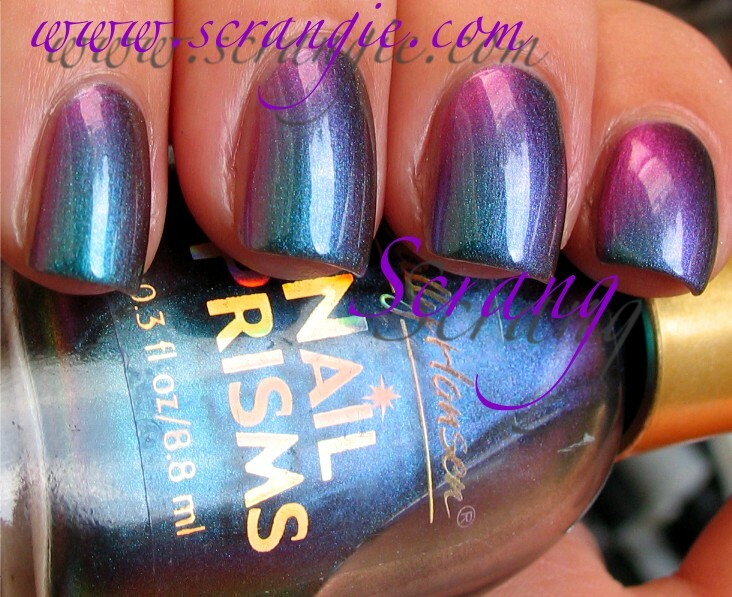 FYI: anyone looking for it and finds Rainbow Presents, that is the Canadian release of this shade. Why the different name, I don't know! I've found that putting two coats of this over one coat of a black creme makes it look fantastic! Burgundy Orchid is my Holy Grail, though Turquoise Opal is a close second. I find using a base coat of black or deep blue helps T.O. look less sheer. I got loads of complements when I wore T.O. with a topcoat of chunky purple glitter. I wish they would bring back colors like this. An opal in a bottle indeed. Thank you for this sharing these beautiful photos! Adoro cor Turquesa! Este esmalte é lindíssimo! Beijos. Ugh, still kicking myself for not hoarding bottles of this after I went through five bottles back in the day. That was when I only had about 15 bottles of polish in my stash. Thanks for showing us how beautiful this is! Love, love, love, love, love! 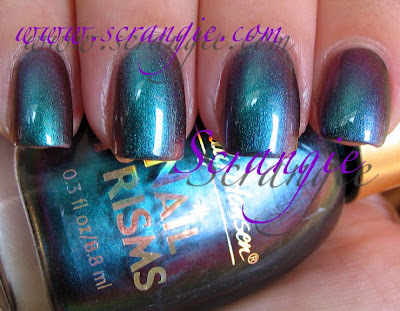 Scrangie.....I shoudl stop reading your blog cause of all of these beauties that are so HTF, but I can't stay away! So beautiful! I have this! I shall take it out tomorrow. Thanks for the gorgeous pics! 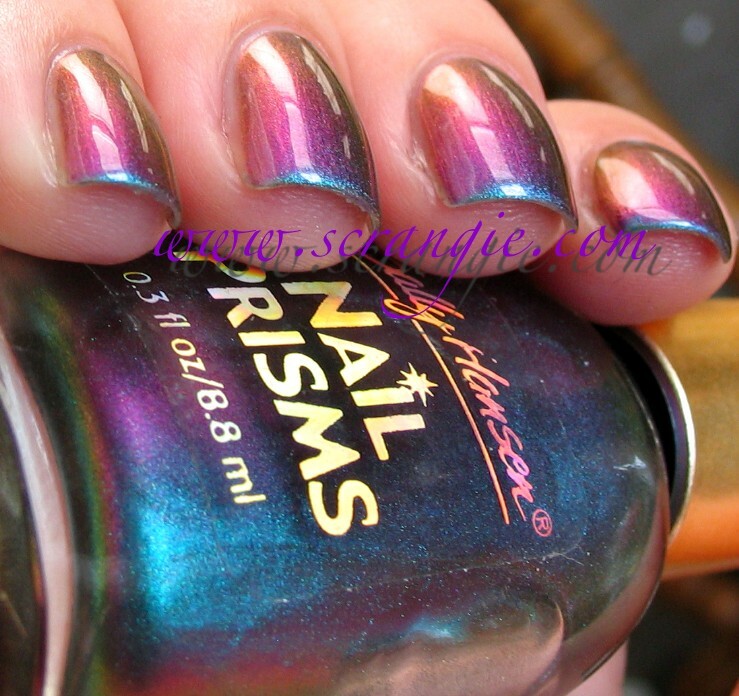 I've found that layering it over black makes all the colours pop more and there's only a need for one or two layers of the Prism, leaving more in the bottle for more manis! *swoon* oh how I wish I was into polish when this was released. Turquoise is my favorite and this is Absolutely divine! So beautiful, it is mesmerizing! 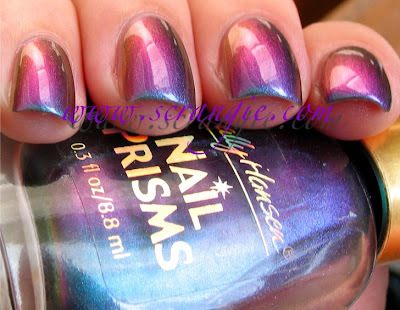 I am so sad that I can't find these Sally Hansen Nail Prisms for the life of me here in the UK. This is so beautiful!!!! it's too bad it's so hard to find. I wish the polish companies would take note of this post,and make a whole new round of these prismatic beauties!This is the most beautious polish on earth! 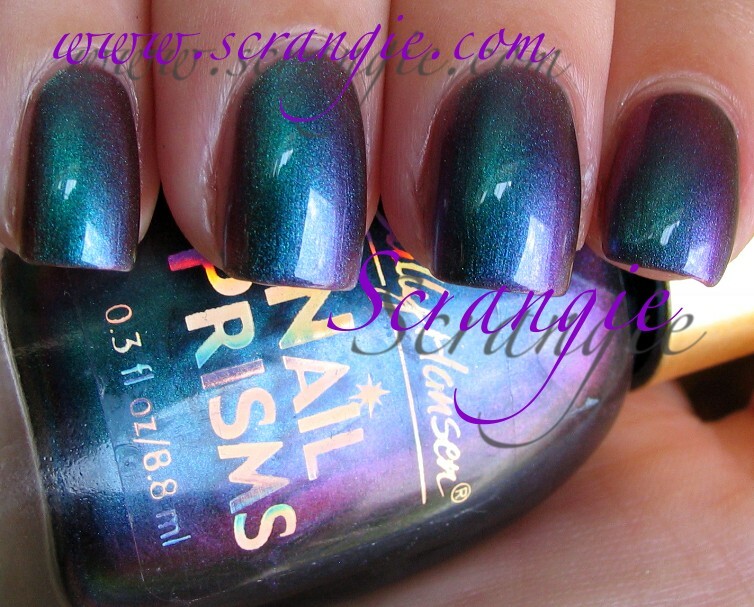 I've wanted this polish so badly for the longest time. And now, seeing your swatches is making me feel like I should just bite the bullet and buy it on eBay. Sigh! The last picture is particularly stunning because it looks like you have a blue French tip almost! Love polishes with a multiple personality. Unfortunately I don't have Turquoise Opal, only Garnet Lapis, but it's such a perfect shade! Can I mail you my address? My birthday is the 25th of December. Kaythxbye! Just joking (or am I? ), this is such a gorgeous color! Love love love your swatches, stunning! I went to see if I could find it but no luck, it is an older bottle? Discontinued? Glad I kept these two polishes from my old stash! 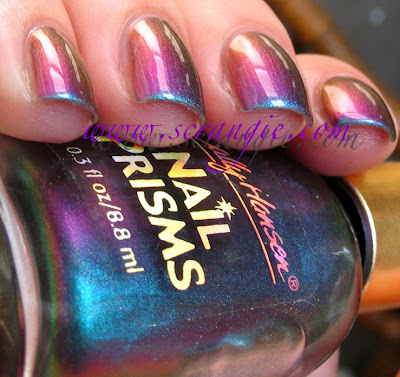 The duochrome effect seems stronger here than most polishes of that type I've seen. Is it just the pictures? Wow, that's amazing. I haven't seen it around in my neck of the woods though. 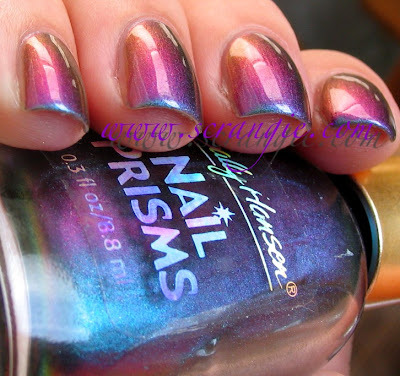 I have to agree probably the prettiest polish ever!! This makes my head explode! First time I've seen this. The companies really need to put these out again. i need to check my local counter for this! too beautiful! I have 9 shades from the Sally Hansen prisms line but not this one, beautiful color. I agree they should release more colors like these, there is obviously a big demand; and next time I will make sure to buy every color. Believe it or not (They haven't made this for years!) I found a bottle of it today at my local Kmart, that is going out of business!! So happy!! New items for fall at Sephora!